A unique summer experience in a Tuscan villa for advanced students of Greek and/or Latin. Designed for high school and college scholars to heighten their expertise in reading classical texts in-depth. Here, in a place where Greek and Roman culture fuse, we make the Classics come alive through an interplay of comparative literature, art, archaeology and travel. This course is designed for dedicated intermediate to advanced students in either Greek or Latin (rising high school juniors and seniors, recent grads/gap year students). Housed in a stunning villa in Tuscany, and surrounded by the Etruscan countryside where Greek and Roman remnants abound, we will read ancient texts that explore underworld narratives and prophecies: Latin students read Aeneid 6 — Aeneas’ famous meeting with the Sybil of Cumae and his journey to the underworld; Greek students read Odyssey 11, Odysseus’ νέκυια to hear the prophecy of Tiresias. Additional related texts are read in each group. The primary goal of this course is to advance students’ reading speed and comprehension of Latin or Greek vocabulary and syntax as well as to engage in discussions of the parallel texts. We will investigate how Vergil appropriates Homer’s underworld, and how we understand Homer’s underworld, mediated through Vergil’s text. In order to facilitate further discussion and understanding of the ancient world, students of Latin read Odyssey 11 in English and students of Greek read Aeneid 6 in English. The starting date of this course is coordinated to permit students to join after the advanced Reading Latin + Art History session in Florence or the Reading Latin + Ancient History course in Rome, both of which end on July 30. Our study of prophecies and the underworld are beautifully visualized in the “canvas” of Tuscany where we have the opportunity to see local treasures such as the Duomo at Siena with its carvings of the Sibylline prophets, along with Etruscan sites in Arezzo, Cortona and Chiusi that exhibit art featuring the same stories and characters that appear in the underworld narratives we are reading. Through our visits to see ancient archaeological sites as well as the magnificent artwork of local Renaissance masters, students enjoy the opportunity to fuse their readings with visual representations. We have use of a spectacular hilltop villa in the heart of the Tuscan countryside. The villa has Roman origins, and has been refurbished by keeping its beautiful “pietra serena” façades untouched. Located just 800 meters away from the village of Palazzuolo, it overlooks its own Chianti vineyard, and is surrounded by a lovely garden and ancient forest. The villa accommodates up to 14 people and offers an outdoor swimming pool, a gym, spa facilities, air conditioning, and satellite TV. The $4000 tuition includes accommodations, transportation within Italy, museum entries, instruction and course materials (certain additional books may need to be purchased). Breakfast and dinner and most lunches are included. 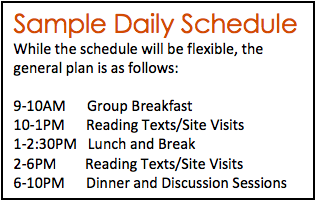 Depending on our daily schedules, students are on their own for some lunch breaks. Students are responsible for the cost of their activities outside of the group. Airfare is not included. Students may travel with our chaperone on both legs of the journey, from New York City to Florence and from Florence to New York City. Calder Classics will arrange transportation between the airport and the villa ONLY for those students who choose to travel with our chaperones. Students traveling on their own must make their own connections to the villa.